Tampa Bay students rally against Trump’s wall and demand protections for undocumented students | Fight Back! Tampa, FL - The Tampa Bay chapter of Students for a Democratic Society (SDS) held a rally April 3 to stand against the U.S.-Mexico border wall and demand protections for immigrant students at the University of South Florida (USF). One of these protections is non-deputization of campus police to enforce immigration policy. 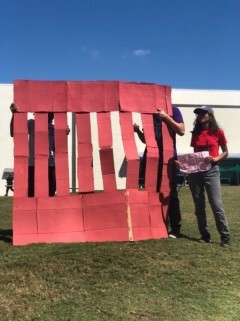 The event featured a mock border wall, symbolizing the recent attacks on immigrants by the U.S. government. “USF needs to stand by its undocumented and immigrant students to make its claims of diversity true. USF has to become noncompliant with federal agencies like the Department of Homeland Security and the Federal Bureau of Investigation, and that, in part, means having a policy of non-deputization of USFPD,” said Tampa Bay SDS member Taylor Cook. Members and supporters of Tampa Bay SDS were met with opposition by supporters of Trump’s border wall, as well as USF administrators, who allowed the counter-protesters to express their hate speech, including sexist slurs. However, SDS members combatted the interruption by continuing their rally and pushing their support for immigrants and undocumented students through chants. While chanting, “Border wall, tear it down,” students were invited up to the mock wall to bring it down. The Trump supporters fell quiet as SDS members and other students united against the border wall. “As we see attacks on immigrants around the country, USF is silent and continues to provide students’ personal information to federal agencies such as the DHS and FBI. They still do not put protective measures in place to help these students,” said Tampa Bay SDS member Will Blake. Tampa Bay SDS continues to stand up against attacks on immigrants, as well as quiet administrators who refuse to protect their immigrant and undocumented students.